Santa Barbara – the epicenter of tough hill climbing in southern California? Quite possibly. 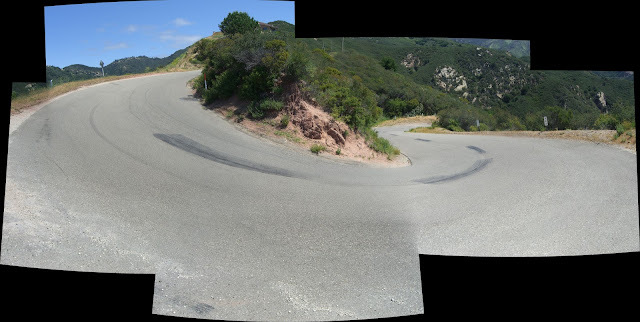 While the mountain roads ringing Santa Barbara do not climb as high as those in the LA area (6-8k+ for some), they do provide for some very stout climbing. Old San Marcos/Painted Cave, Gibraltar and Figueroa Mountain are three of the toughest, most scenic climbs around. Refugio Road ranks right up there with these climbs. This is a steep and scenic climb about 20 miles north of Santa Barbara just off the 101. Given the slightly more remote location and the fact that it is not a through road (unless you are willing to descend down a rough dirt road on the other side), Refugio gets very little car traffic. It gets significantly less traffic than Old San Marcos or Gibraltar – and those climbs don’t get all that much traffic. Refugio has one more thing going for it that rarely gets mentioned – you can (and should) connect with West Camino Cielo at the top of the Refugio climb. The Camino Cielo section is much more mellow (aside from the last mile or so), but offers one of the most beautiful and scenic stretches of climbing in southern California. Taken together, this ride has it all – super steep stretches, great scenery and sustained climbing (you start at almost sea level and hit ~4000 ft in elevation). First ~0.5 miles of climbing: Just under 15%! If you like to climb, you need to find your way to Santa Barbara. Santa Barbara arguably has the most easily accessible, tough and scenic climbs in southern California. I’ve already written about the Old San Marcos/Painted Cave climb – one of the toughest around – so now it is time to tackle Gibraltar Road. To start, you have a couple of options. You can start at Tuckers Grove Park and give yourself a few miles of warm up. You can also start at the Santa Barbara Mission and give yourself no warm up. Either works for a starting location, but I would recommend Tuckers Grove – this gives you some rolling hills to warm up with and lets you finish with a great descent. If you start at the Mission you will climb immediately and finish with rolling hills. Anyway, the rest of this assumes you start at Tuckers Grove. Make sure to click on the link to see the higher resolution version. From there you can click the Download tab and choose Download Photo if you would like to download the full size, original version of the panorama (8271×2670 pixels in size…so yeah, pretty large). Santa Barbara (Goleta, specifically) is where I grew up and where my parents still live, so I have spent a fair amount of time in the area. While San Marcos Pass Road (State Route 154) is now the preferred automobile route (due to a gentler grade and lack of tight curves), there still exists the old stagecoach route from the 1800s. This stagecoach route is steep, twisty and incredibly scenic (and, paved..quite nicely too!). There is quite a bit of history with the pass – you can read more about its history here and here. This route is known officially as North San Marcos Road and unofficially as Old San Marcos Pass Road. Old San Marcos, on its own, is a sweet, steep, tough and scenic climb absolutely worthy of climbing by any serious cyclist. But, at 3 miles long it is a bit short. You are in luck though. Old San Marcos leads right into Painted Cave Road, adding 2.4 miles of even steeper climbing to an already steep climbing route. 8.3% average grade for almost 5.5 miles. This is definitely one of the steepest sustained climbs around. Gorgeous still, but don’t expect tons of shade. The above will give you a nice 1600 pixel wide view.